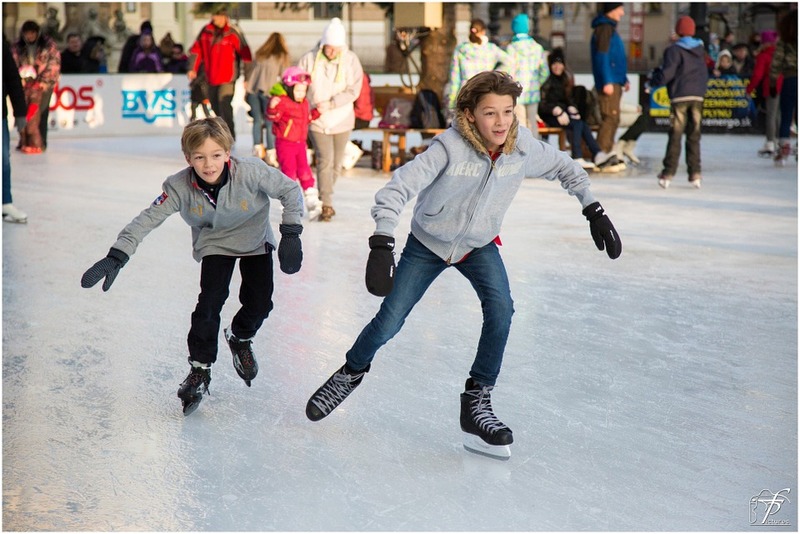 Here are the tips for the first time Ice skaters to make the ride smooth and sound. 1 . Wear proper clothes. When ice skating, you should wear clothes that are easy to move around in and will not get heavy when wet. Do not wear jeans. When you fall they can get damp and will be harder to skate in. Try some warm, thick leggings, t- shirt, jacket, gloves, and hat. 2 . Find good skates. Skates should be fitted for comfort and are available in most shoe sizes. It's a good idea to measure both feet as one foot can be bigger than the other. Also, measure the width of your foot while sitting down. There are a number of good brands you can buy, but rentals are adequate for your first steps. 3. Try walking. Most skate rinks have rubber matting you can walk on. 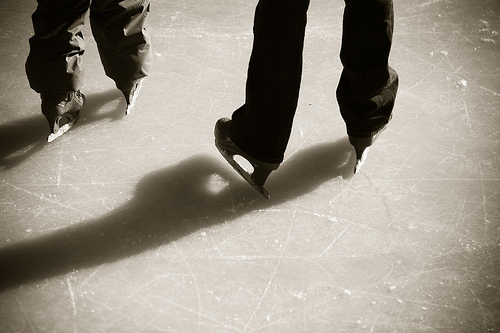 Walk around to help maintain your center of gravity but remember to keep your skate guards on. 4 . Get on the ice. Walking around the edge of the rink while holding the wall will help you get a feel for the ice. The keys to skating well are relaxation and technique. Learning to walk will help give you ankle support and help you get used to the friction of the ice. 5. Learn to maintain your balance. Start by holding your arms out at just below shoulder level to learn to balance yourself. Bend your knees slightly and lean forward, not back. Try not to hold onto anything. The wall can become a crutch. 6. Once you maintain good balance try skating a little faster. If you feel like you're going to fall, bend your knees and put your arms out on the side of you. 7. Try hard. Skating is a very hard sport, but if you try you will get it going well. Practice, practice, and more practice will help a lot.You'll soon get the hang of it! 8. Do squats. Stand up straight, feet at hip distance, and arms in front of you. Now, squat slightly, just enough to find your center of balance, and repeat a few times until you feel comfortable. When you're ready, try squatting further down, just until you feel your knees bending. Keep your eyes looking forward at all times. 9. Practice falling. Falling is part of the sport so it's natural that this will happen. If you anticipate the fall bend your knees and squat into a dip position. Otherwise, put your hands out to break your fall but quickly clench your fingers into a fist so that you don't run the risk of losing any fingers from a passing skater. Also, try to push your arms out so you will have a safer fall. 10.Practice standing up. Get on your hands and knees and place one foot between your hands. Repeat with your other foot and lift up until you are standing again. 11. Move forward. Lean on your weak foot, then push in a diagonal direction outwards with your strong foot. Pretend as though you're shoveling snow behind and to the right of you. This will propel you forward. Then bring the right foot back in next to the left and repeat the process. If you would like to glide point the toes out the way they are in for example right foot, point your right toes out. Now just make little loops with your foot or ride on an imaginary scooter that is on the ice. 12. Take longer strokes and try to glide. If you try to give an extra flick of the toe/ankle at the end of each stroke, you will get more power and become a more efficient and faster skater. Bend your knees and move your body with the strokes. 13. Learn to stop. To stop, bend your knees slightly inward and then push out with one or both of your feet. You should put a teensy bit of pressure on the ice so as your feet will not slide out from under you. When you stop, you should have created a little bit of "snow" that was sheered off from the ice. Don't worry if you don't get this at first, but try again because you will get better. * Try to be relaxed when you fall; a limp body is far less likely to get injured than a stiff body. * If falling forward, keep your chin up. * If falling backward tuck in your chin -- this, along with No. 2, will help you keep from hitting your head on the ice. * Try to prevent wrists, elbows, hips, and knees from hitting the ice first. * Try to land on your bottom first. * For extra protection, wear protective gear like knee braces to prevent injury. * Pull your hands in to protect them from getting run over by other ice skaters. * To get up from a fall move to your hands and knees, place one skate under you, and put the other skate under you as soon as practical and lift yourself up. * Begin skating slowly in a forward direction. * Turn one skate at a 45-degree angle and drag it behind the other skate. * Pull the skate that is being dragged into the instep of the lead skate. * Shoulders should remain straight and forward in the skating direction. * Arms should be out to the side. * Lean back slightly and shift the body weight to the rear skate that is being dragged. * Arms should be straight out to the side. * Bend the knees, lean back slightly and push the skates apart. * As the skates are pushed apart, the feet should begin to form a pigeon-toed position. * The inside blades are used to shave the ice. * Begin skating at a moderate speed in a forward direction. * Arms straight out to the side, skates should be slightly apart, knees bent. * Simultaneously twist the shoulders in one direction and the feet in the opposite direction. * The lead skate will shave the ice on an outside edge, the trailing foot will shave the ice on an inside edge. * The hips and skates are facing to the side; the head, chest and stomach should be facing the skating direction.